How often do you feel overwhelmed, drained, discouraged by work? Not enough hours in the day? Need a vacation? Well it might sound very strange to speak of relieving these feelings by adding something to your life, but let me explain! A week ago, on Friday, I was preparing for a very full weekend. I had a performance of The Bessie Bluefeld Story scheduled for 12:30 on Sunday in Baltimore. Later that same day, I needed to be at National Airport for a flight to FL to attend a three-day conference that I had been looking forward to for months. And I was finishing up a letter of agreement for a new client! In the middle of all of this, I got a request from my dear friend Kris Swanson, founder of The Corner Store Studio and Performance Space, to help her with a memorial tribute for her best friend, Laurie Siegel, dedicating their community art project of the YUME tree mural on the outer wall of the 12th St. SE CVS (in my old neighborhood). I knew that Kris had a “life-long fear of public speaking, ” (her words, from her testimonial to me afterwards) and I had offered to help a while ago. In fact, we had spoken the week before about her intention for this talk. But now it was Friday, and how in the world would I find the time to work with her before her presentation on Saturday? I’m a nervous traveler and really wanted this weekend to be peacefully packed! Well something deep inside me said, “This is very important. We can make it work.” And I’m so glad I did! First of all, working with Kris on the text of the dedication gave me a very moving insight into an artistic collaboration and friendship that very few people get to experience. Here’s the story, taken from The Corner Store website. 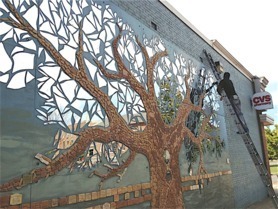 “The 28′ by 14′ mosaic tree by Kris Swanson was created with help from dozens of friends and neighbors and installed in 2003. Laurie Siegel, by firing many of the first mosaic tiles & designing the classroom syllabus, was crucial to the project. She served as one of three original board members at The Corner Store, and was an award winning arts educator and tireless advocate for the arts, a wondrous glass artist, and the kindest person I’ve known. Her students at Watkins were among the first to make their names tiles for the Yume Tree. At the event itself on Saturday, I began to re-experience my own connection with the Yume tree. My beloved granddaughter Olivia was a student at Watkins and had made one of the original tiles. Then at one of the community celebrations, I had made a donation for tiles for my other two granddaughters who were already out of school. Three people I love most in the world are permanently part of this amazing collaboration. When I heard Kris tell the Yume story that we had worked on, as I stood among the many celebrants of this very special occasion, I felt a part of something larger than my own concerns about letters of agreement and packed suitcases. I felt uplifted and connected to my community. I felt nourished in a way that I would have missed had I not found a way to make room in my day for this experience. And I got everything else done without having to stay up till the wee hours!